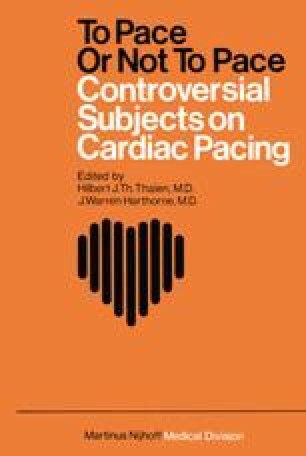 Permanent atrial pacing from the coronary sinus has been used since 1958 (1–5) and has been shown to provide better cardiovascular function. (6’9). This is a report of our experience with this method of 66 consecutive patients. A special lead was used with a flexible tip extending beyond the distal electrode to prevent dislodgement from the coronary sinus during inspiration (Fig. 1 ).